C.F. Martin & Co. and multi-platinum singer-songwriter Ed Sheeran continue their collaboration with the unveiling of the Ed Sheeran X Signature Edition model from the Martin Custom Shop. 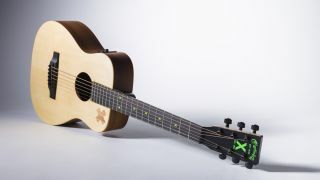 The guitar follows the LX1E Ed Sheeran Signature Edition, which the company debuted in 2013. As he did with the LX1E (which has sold out), Sheeran is donating 100% of his royalties from the sales of each guitar to East Anglia's Children's Hospices (www.each.org.uk), a UK-based charity in his hometown. The organization, whose Royal Patron is The Duchess of Cambridge, supports families and cares for young people with life-threatening conditions and provides services across several UK counties, including Suffolk, where Sheeran was raised. "It was a huge privilege working with the Martin team to create another Signature Edition guitar," said Sheeran. "I've had the chance to bring the new model on the road with me already, and I'm excited that my fans will be able to purchase one of their own, with all the proceeds going to EACH, a charity very close to my heart." Designed in collaboration with the Grammy-nominated artist and brand ambassador, the Ed Sheeran X Signature Edition features his signature "x" (Multiply) sign on the headstock and down the fretboard. The six times platinum-selling album's logo is inlayed in solid koa on a solid spruce wood top. The model comes stage-ready, equipped with Fishman Isys T electronics, SP Lifespan Martin strings and a padded gig bag. "I take great pride in the relationship we have with Ed," said Amani Duncan VP of Brand Marketing for C.F. Martin & Co. "He is not only an incredible talent but also an extremely compassionate human being. Over 182 years, Martin Guitar has had the privilege of working alongside legendary Artists, and we are proud to be able to continue this long-standing tradition and musical journey with Ed Sheeran." The Ed Sheeran X Signature Edition is available for pre-order today. Visit Martin Guitar for more information.